Reflect your bash’s festive vibe and treat guests to a drink on the house with the All Purpose Chalkboard Black and White Drink Ticket. 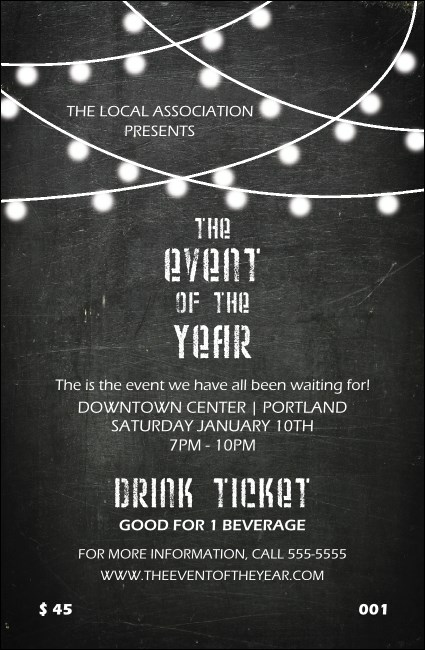 Strung with twinkle lights, its black background makes event details shine in white typeface. Customize to your needs in minutes—we’ll print in black and white then ship in a flash! Dimensions are 2.71" x 4.14"
Make it easy to regulate bar costs and speed up lines with drink tickets from TicketPrinting.com.